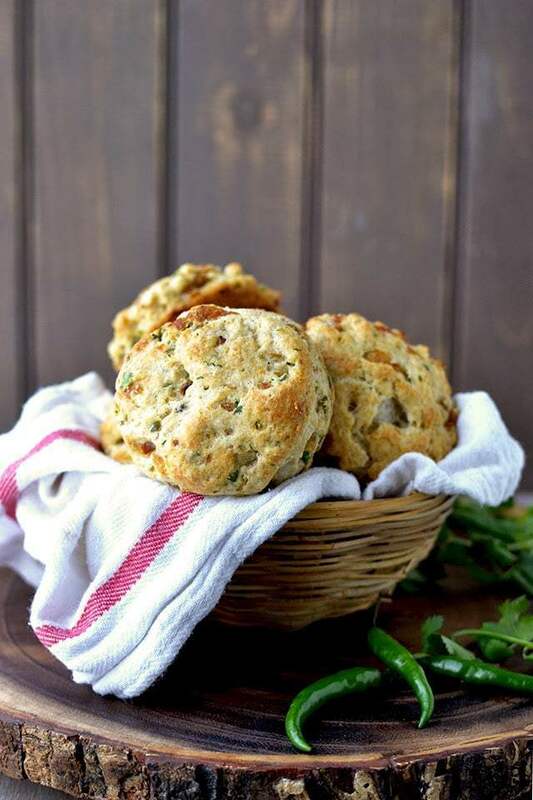 Indian flavored Sourdough biscuits with caramelized onions. They can be served for breakfast or even for snack. Leftovers can be stored in airtight container and reheated before eating. Heat 1tbsp oil in a pan on medium-low flame, add the onions and cook for about 20~30 minutes, stirring every 5 minutes. They should be nicely caramelized by this time. Transfer the onions to a bowl, cool to room temperature, then refrigerate until well chilled, at least 3 hours. Preheat the oven to 425°F. Grease or line a baking sheet with parchment. In a mixing bowl, combine the flour, baking powder and salt. Work the butter into the flour until the mixture is unevenly crumbly. Toss in the green chilies, curry leaves, cilantro and caramelized onions. Cut in the starter until the dough becomes cohesive. Turn the dough out onto a lightly floured surface and fold it over itself 5~ times until it comes together. Pat it into a 1" thick disk -- use a sharp biscuit cutter to cut rounds. Pat the scraps together and cut into additional biscuits. Bake the biscuits for 15~18 minutes, until they're just turning golden. Remove from the oven and serve warm.